[:en]The quirks of modern life may be of nugatory interest to the old guard of fine jewellery, but through a new generation of designers, keen to see themselves in their work, the humour, wit and playful irreverence of youth is working its way into luxury jewellery. For Alison Chelma, who designs fine jewellery out of New York under the brand Alison Lou, it was the emoticons she was sending in text messages and posting online that captured her imagination. “I always wanted to be a jewellery designer, but it wasn’t until I had a concrete idea that had never been done before that I decided to pursue it,” she says. “When I started three years ago, I saw that people were using emoticons on their phone as a way to communicate with one another. To me, jewellery is all about communication so I thought that this would be the perfect marriage.” Rather than taking what some might see as a transient social trend and applying it to something more seasonal, such as costume jewellery, Chelma put her money where her winky face was and created a line of solid gold pendants and ear studs with all the emotions of the keyboard played out in enamel and gemstones. The collection has been a huge success, winning Chelma fans around the globe who aren’t put off by the higher price tags the precious metals bring, and care not if emojis will be out next season. Net-a-Porter has been selling Alison Lou jewellery and recently launched an exclusive line of full diamond pavé emjoji necklaces with price tags of £8,000 each that completely sold out. “We have a huge range of clients buying Alison Lou pieces, ranging from our younger customers through to women in their 50s,” says Net-a-Porter fine jewellery buyer Sophie Quy. 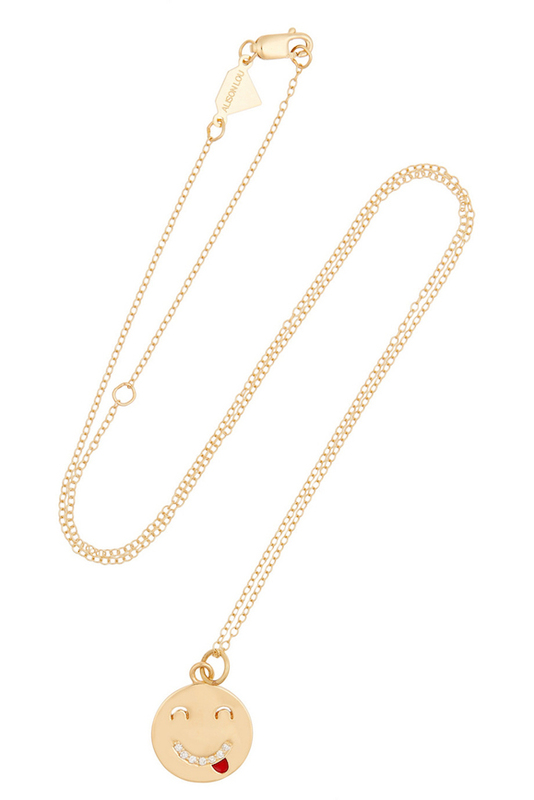 “I actually sold an Alison Lou emoji necklace with heart eyes to a grandmother who said it reminded her of her grandchildren as they always use them in their text messages.” Net-a-Porter has a number of other humorous designs in its fine jewellery offering, such as Diane Kordas’s collection of cartoonish gold jewels that spell out words like WOW! and BOOM in diamonds, or Sabina Kasper’s Punk Pearls collection that adds pink tourmaline tips to white pearls to mimic the silhouette of a kitten. Tongue Out gold, enemal and diamond pendant by Alison Lou While the appeal of these jewels might range from 20-somethings to grandmothers, Quy does believe that this shift towards humour in fine jewellery is being ushered in by a new era of designers. “There is just as much humour and fun in fine jewellery as there is in any of our other categories,” she says. “I think as designers have become younger, the designs themselves are more youthful and less formal than they used to be.” One of the hottest fine jewellers of the moment is undoubtedly Delfina Delettrez, a 28-year-old heir to the Fendi fashion dynasty and daughter of jewellery designer Bernard Delettrez. She describes her jewels as “toys for adults” and her whimsical, modern designs – particularly the surrealist Anatomik collection that uses gold, enamel and gemstones to create abstract faces – have captured the imagination of jewellery lovers. Tessa Packard is another young jewellery designer who has been unafraid to introduce humour to luxury jewels. Last year, the British designer unveiled a collection called Fat Free that combined precious materials to create jewellery resembling gummy bear sweets, pretzels, half-eaten chocolate bars and a striking pair of white gold, diamond, topaz and yellow agate Fried Egg earrings costing £15,000. But its not just the youngsters getting into the spirit. 178-year-old heritage brand Tiffany & Co broke ranks last year when it teamed up with hip department store Dover Street Market. While Tiffany & Co has long been famous for its whimsical designs – and indeed the sell-out Out of Retirement collection of jewels and precious objects sold through Dover Street Market’s shops in London, Tokyo and New York were reintroduced from its archives – the sales environment was fun, with jewels displayed behind magnifying glasses in London and worked into playful, miniature beach scenes in New York. By Rachael Taylor[:zh]The quirks of modern life may be of nugatory interest to the old guard of fine jewellery, but through a new generation of designers, keen to see themselves in their work, the humour, wit and playful irreverence of youth is working its way into luxury jewellery. Rather than taking what some might see as a transient social trend and applying it to something more seasonal, such as costume jewellery, Chelma put her money where her winky face was and created a line of solid gold pendants and ear studs with all the emotions of the keyboard played out in enamel and gemstones. The collection has been a huge success, winning Chelma fans around the globe who aren’t put off by the higher price tags the precious metals bring, and care not if emojis will be out next season. Net-a-Porter has been selling Alison Lou jewellery and recently launched an exclusive line of full diamond pavé emjoji necklaces with price tags of £8,000 each that completely sold out. 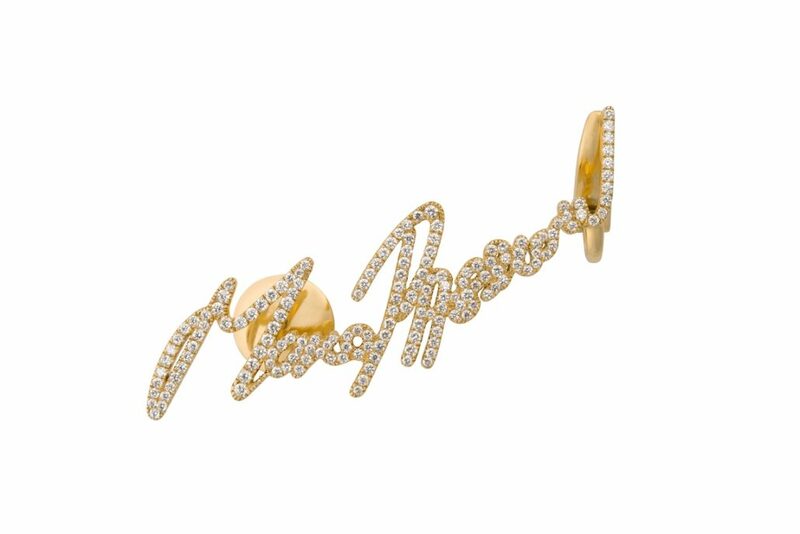 Net-a-Porter has a number of other humorous designs in its fine jewellery offering, such as Diane Kordas’s collection of cartoonish gold jewels that spell out words like WOW! and BOOM in diamonds, or Sabina Kasper’s Punk Pearls collection that adds pink tourmaline tips to white pearls to mimic the silhouette of a kitten. One of the hottest fine jewellers of the moment is undoubtedly Delfina Delettrez, a 28-year-old heir to the Fendi fashion dynasty and daughter of jewellery designer Bernard Delettrez. 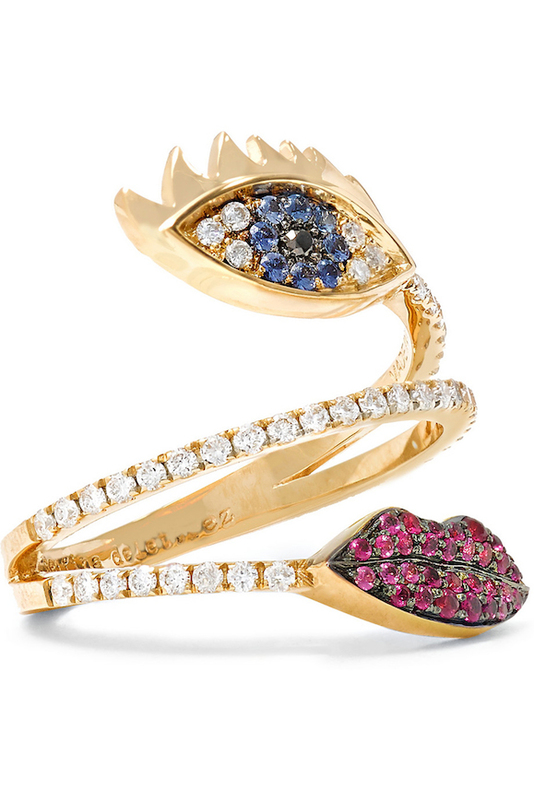 She describes her jewels as “toys for adults” and her whimsical, modern designs – particularly the surrealist Anatomik collection that uses gold, enamel and gemstones to create abstract faces – have captured the imagination of jewellery lovers. Tessa Packard is another young jewellery designer who has been unafraid to introduce humour to luxury jewels. Last year, the British designer unveiled a collection called Fat Free that combined precious materials to create jewellery resembling gummy bear sweets, pretzels, half-eaten chocolate bars and a striking pair of white gold, diamond, topaz and yellow agate Fried Egg earrings costing £15,000. But its not just the youngsters getting into the spirit. 178-year-old heritage brand Tiffany & Co broke ranks last year when it teamed up with hip department store Dover Street Market. While Tiffany & Co has long been famous for its whimsical designs – and indeed the sell-out Out of Retirement collection of jewels and precious objects sold through Dover Street Market’s shops in London, Tokyo and New York were reintroduced from its archives – the sales environment was fun, with jewels displayed behind magnifying glasses in London and worked into playful, miniature beach scenes in New York. For British jeweller Theo Fennell, who has long been creating precious jewels that are wonderfully witty, getting it right relies on not allowing craftsmanship standards slip just because the subject matter is light. “Good, well made and designed, quirky jewellery is very difficult to do but, when done well, it is the most fabulous present and has a wonderful effect on the wearer and anyone who sees it,” he says. Fennell points out that humour has been used by fine jewellers as a tool to engage buyers for centuries, but concedes that recent homogenisation of the jewellery industry may have spurred on the next generation of jewellers to break free from convention and inspired this new wave of blithe designs with serious price tags. More Passion gold and diamond ear cuff by Tracey Emin for Stephen Webster[:nl]The quirks of modern life may be of nugatory interest to the old guard of fine jewellery, but through a new generation of designers, keen to see themselves in their work, the humour, wit and playful irreverence of youth is working its way into luxury jewellery. More Passion gold and diamond ear cuff by Tracey Emin for Stephen Webster[:de]The quirks of modern life may be of nugatory interest to the old guard of fine jewellery, but through a new generation of designers, keen to see themselves in their work, the humour, wit and playful irreverence of youth is working its way into luxury jewellery.